Ballpark Basics: A downtown ballpark where the game is the focus. 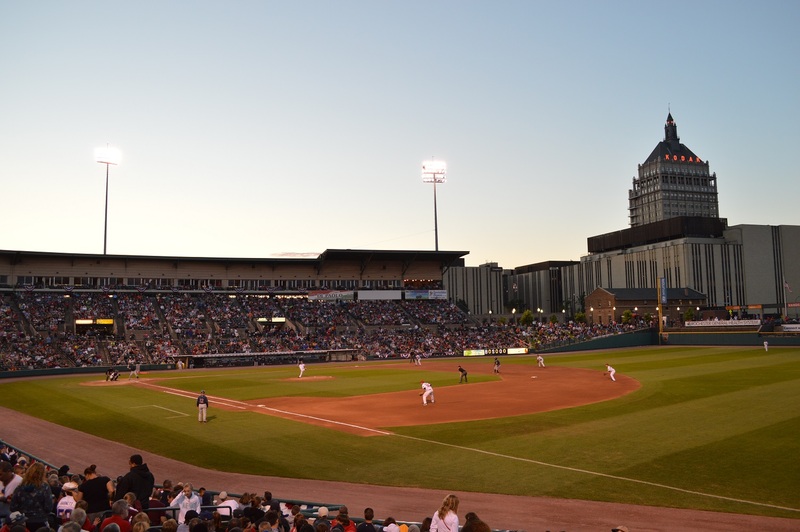 Ballpark Breakdown: Frontier Field is a short (and scenic) walk from a New York brewing institution, the enormous Genessee Brewery. Simply cross the Pont de Rennes bridge over the Gennessee River where you can see the High Falls and continue down Platt Street. This will bring you right to the left field corner entrance of the ballpark. Built in 1996 Frontier Field does not have a lot of the bells and whistles of most parks of its era. The concourse sits behind the seating bowl so you can’t see the game while you are getting your food. The concourse does not wrap around the entire ballpark. The berm seating is small and tucked away in each outfield corner. The seating bowl is separated into two sections by a walkway with the luxury suites located at the very top along with the press box. 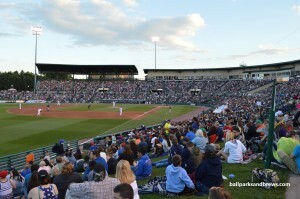 In the left field corner there is a picnic section along with the children’s area with a small section of inflatables. In the right field corner there is another picnic area that is covered and can be rented out on a per game basis. 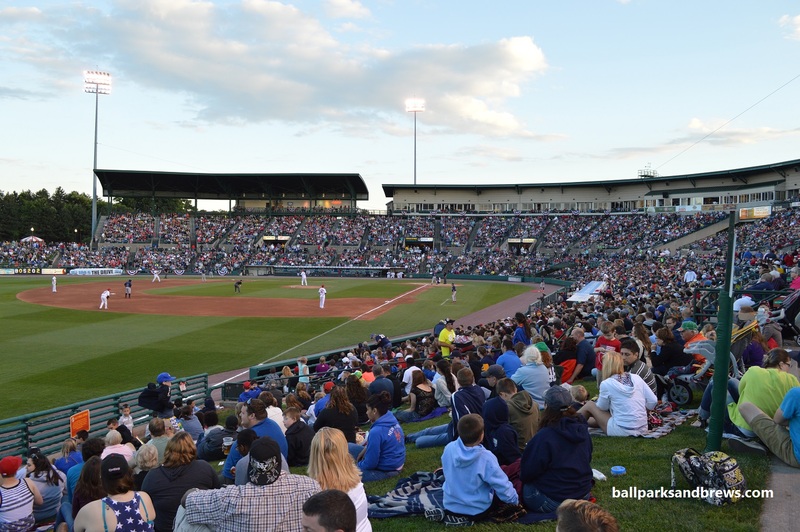 The best seats (in our opinion) are down the first base side where you can see all the action with the Kodak Tower peering over the grandstand. Having been the Orioles AAA affiliate for over 40 years you will notice a lot of nods to Oriole greats that spent some time in Rochester. There is a statue dedicated to Joe Altobelli, who spent time as a Rochester player, manager and even the GM. There is a small sculpture for Cal Ripken, Jr. as well as many Oriole greats listed in the Red Wings Hall of Fame. 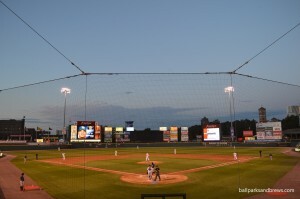 Both local breweries have a presence at Frontier Field in the form of individual stands dedicated to their exclusive beers as well as in other concession areas around the park. There is also a craft beer stand on the third base side with local and other craft beer options. 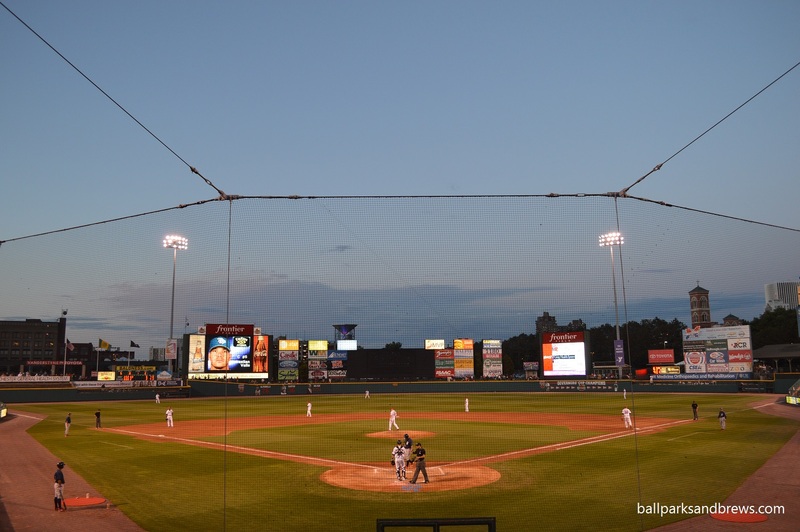 While there is not a ton of extras that you would expect at Frontier Field that does not mean that it is not an enjoyable place to watch a game. With a passionate and knowledgeable fan base that is there to actually watch the game you don’t need many of the distractions that you find at many modern parks. 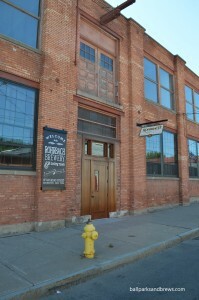 Based on the pictures and images on their walls, Rohrbach celebrates pioneers, including their founder who was living in Rohrbach, Germany, immigrated to the U.S. and ended up opening the first craft brewery in Rochester. Like Nickel Brook (and several others we have encountered) since they were some of the first to bring craft beer to the area, you’ll even see definitions of common beer terms on their menu including “growler” and “brewpub”. Rohrbach puts effort into giving back to their community too. 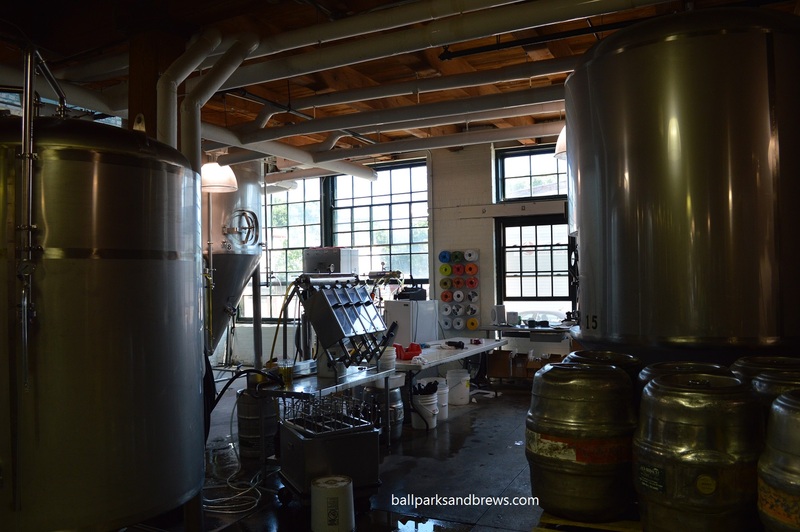 Some examples of this are the locally sourced ingredients they use whenever possible, and how they donate their spent grain to local farmers. We almost missed out on this one, after checking Facebook, their website and Twitter for any info on July 4th closings or special hours and finding nothing, we arrived to discover they were closed. Fortunately they are successfully ensconced in two locations and through the original downtown taproom wasn’t open, the more suburban brewpub opened at 4 pm. 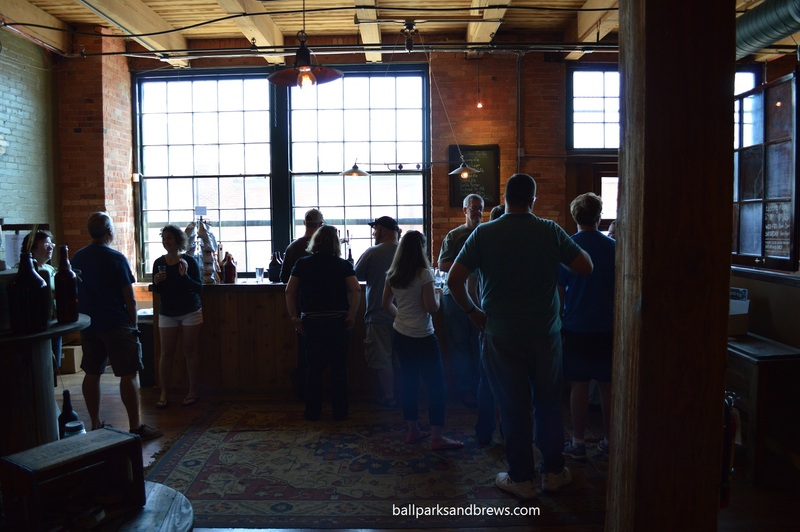 If you’re looking for the most modern of craft beer stops, and not a warm local spot in northern New York then this wood cabin style building is not your stop. They’ve got black and white tiled floors, wood paneled walls and 90’s-designed formica tables; above you’ll find rustic wood beam trellis with clear Christmas lights. 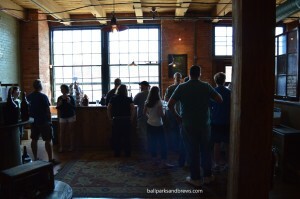 There is a dining room, party area and the bar, which had the blinds closed to keep it dark, and chalkboards listing the beers but no info on ABVs or descriptions of their seasonals. Before leaving the next day we were able to swing by their Brewpub right after they opened for the day. This place is the main brewery (although they do brew some of the beers on location at the brewpub as well) They were just starting to can when we were there so a mixed six was out of the question. Having been let down by the closed downtown location and then trying not to judge the pub we sidled up a bar top table and discovered happily, the beer was worth the trouble. Whipple Smash (5.8 ABV/ 40 IBU) – Single malt, single hop beer that’s red colored and smells malty and slightly sweet in the cinnamon/earthy sense not a sugared sweet that Rohrbach claims is “fresh cut grass”. Fairly strong carbonation with toffee like notes upfront and malted finish. This beer is an example of the local sourcing mentioned earlier, as it is brewed in coordination with the Whipple Brothers who are farmers “bringing the hop crop” back to Northern NY. Scotch Ale (7.0 ABV/16 IBU) – a red ale in style that’s more brown colored than the Whipple. Smells “funky” or at least very different from the other beers like there is a bit of light, warm liquor in the beer. It has light but still noticeable carbonation and decent ale flavor which peters out quickly. The color of deep whiskey, it warms your belly and is the most popular of their beers. 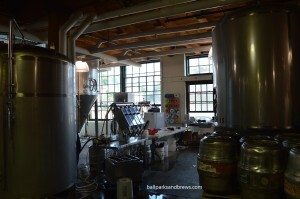 Railroad Street IPA (6.5 ABV/66 IBU) – Lotta hops! Hop front, hop finish, strong, tart and bitter. The Railroad IPA brings a light floral hop smell and typical golden IPA color. The palate is strongly but not overly hopped and the hops are consistent through and through instead of building and leveling off. Vanilla Porter (6.5 ABV/23 IBU) – Solid, smells mostly of vanilla and malts with even a little of an extract smell at the end. This porter is creamy and dark coffee colored with a tan head. It’s not terribly balanced in that it is strongly vanilla in the sip and even finishes with strong vanilla bean notes. This is served warmer than the others, which brings out the flavor – so this is how we suggest you drink it as well.